Can you give me some examples of an effect size? Can you give me three reasons for reporting effect sizes? Which editors have encouraged the reporting of effect sizes? Why can’t I just report the R2? Where can I find a good effect size calculator? 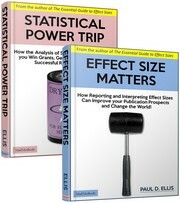 Can you recommend a plain English introduction to effect sizes? What’s the difference between Type I and II errors? Can a result be statistically nonsignificant but important? Why should I interpret the substantive significance of my results? Which journal editors insist researchers interpret the substantive significance of their results? Why is it a dumb idea to interpret results by looking at p values? What are some conventions for interpreting different effect sizes? What is the “curse of multiplicity”? What are three good reasons for doing a meta-analysis? Why are you so convinced I can learn meta-analysis?